Supplies: Simon Says Stamp Road Trip stamp set, EK Success real wood sheets, Xpress it paper, Copic markers, CraftSmith kraft cardstock, fun foan,Simon Says stamp Bundle of Stitched Shapes die,Scor tape, Neenah 110lb card base. I am once again using the Color My World stamp from Wplus9, This stamp set gives me the opportunity to create a colorful card and I took advantage of that, by pairing it with Ken Oliver’s Color Burst watercolor paints. The result is a bright happy card, that just makes me smile. I realized recently that mail to Canada is incredibly slow. My Valentine cards to my Grandchildren arrived well AFTER Valentine’s Day. This means that I must get cracking on my St. Patrick’s and Easter cards if they are to arrive on time. Here is one of the Easter cards that I have made so far. It is an older stamp, but a goodie. I think it reminds me of my childhood, when I felt a bit like a murderer when biting into my chocolate rabbit. I started with what I thought was the non-essential organs, but eventually, my love of chocolate took over and the whole rabbit was devoured. I think I picked this stamp up at the Mesa Rubber Stamp show last year. No identifying marks on it so I have no idea who made the stamp. Supplies: Mystery Bunny sta,mp, DCWV grass paper, Dienamics Grassy Hills die,Doodlebug Hello Sunshine patterned paper, Doodlebug sequins, Recollections cardstock. Scor tape, Copic markers, Fun Foam, Simon Says Stamp Circle dies, Lil Inker Sttiched Rectangles die, Hero Arts card base. Happy Mail time! I received the new WPlus9 Color My World stamp set and Artist Palette die set recently. It was only when I went to make this card, did I realize that the dies aren’t sized to cut out the images on the stamp set! At first I was quite annoyed, as I had bought them together as a stamp and die set. I am starting to get over it, as it might be handy to have two sizes of palettes and tubes of paint depending on the design of one’s card. I loved the stamp set so much it was one i ordered by itself……………….damn the shipping costs……………….I wanted it before it sold out. 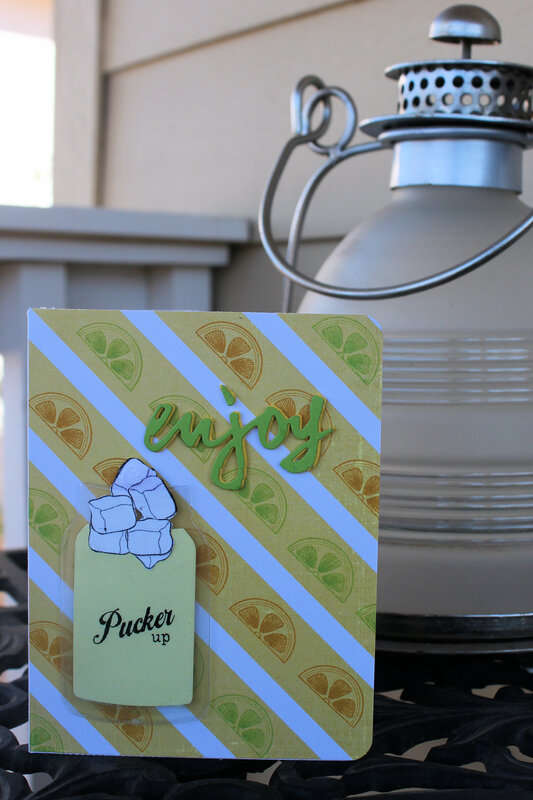 This card was put together using the palette and artist brush from the die set and the paint tube from the stamp set. Supplies: WPlus9 Color My World stamp set and Artist Palette die set, Zig Real Brush Markers, Dienamics Basic Stitch Lines dies, EK Success wood sheets, Hero Arts card base, Scor tape. There is a new Make it Monday Challenge today…………..even though it is Wednesday???? Anyway I am always up for a cardmaking challenge no matter what day it is. Supplies: Papertrey Ink Friendship Jar Fillers stamp set, Friendship Shaker jar die, Papertrey Ink Wet Paint die, Pink Paislee patterned paper, Unknown cardstock, fun foam, EK Success adhesive plastic, Hero Arts Acetate, Scor tape, Tombow adhesive. I have run into a catch 22. I want to have some fun subjects for scrapbook layouts, but I seem to be having too much fun doing things to get them captured on a layout. Oh what a wonderful dilemma to have! This week, however, I have found the time to capture two of the events on scrapbook layouts. The first is our trip to Scottsdale to go to the Top Golf entertainment complex. What a fun event to dine and enjoy a cocktail while having a GPS enabled golf ball confirm what a truly terrible golfer I am! It is fun though that a duffer like me can outscore a “wild” long distance golfer. Well that didn’t happen either…………….but the possibility does exist! The second event that I managed to do a layout on was the Pueblo El Mirage Canadian Banquet. A great time was had by all! 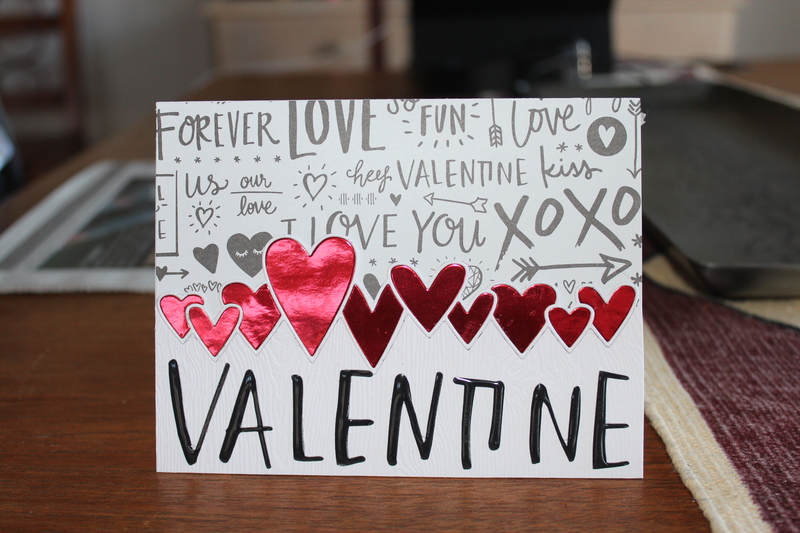 I am busy making Valentine cards for my grandchildren back home in Canada. Of course, I love and think about them every day, but as Valentine’s Day approaches, I think about what Valentine’s card would be best for each of them. I haven’t completed them all yet and I really need to get them in the mail, but I have some done. The one below fits into the current theme of “hearts” on the Simon Says Stamp Wednesday Challenge. They are featuring Reverse Confetti stamps, but sadly I don’t own any yet, so this one will have to suffice. The Make it Monday Challenge is to use Ombre in a Valentine Theme.